To ask I.A. Ashcroft questions, please sign up. I.A. Ashcroft It depends. I find writer's block comes in a lot of flavors. If I'm not feeling a particular scene, I skip to a different one that I am interested in…moreIt depends. I find writer's block comes in a lot of flavors. If I'm not feeling a particular scene, I skip to a different one that I am interested in - this is why I have scenes completed for two books down the road. If I NEED to write a scene I'm not feeling, though, I've found the best I can do is to lie down and go into a deep meditation for about twenty minutes. It is critical that everything is silent. This, unfortunately, means I do get interrupted a lot, and some critical scenes bother me for days or weeks like this. But once I get my twenty minutes... my brain pops out a little thread for me to tug, and it almost always eventually takes me where I want to go, even if it wasn't where I was expecting. I don't post a lot of science-related content in spite of writing science-fiction and fantasy—perhaps that should change! We’d love your help. Let us know what’s wrong with this preview of Get Real, Get Gone by Rick Page. We’d love your help. Let us know what’s wrong with this preview of The Alchemist's Box by Alex Avrio.
" Hi Dianne! 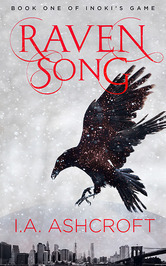 Just wanted to thank you for the kind words and feedback in your review for Raven Song! It made my day. I'm in the midst of refining the se Hi Dianne! Just wanted to thank you for the kind words and feedback in your review for Raven Song! It made my day. I'm in the midst of refining the second in the series now, and seeing someone enjoy the first book never fails to vault me forward. I look forward to seeing your other reviews pop up in my feed! ~I. A. Ashcroft ...more "
We’d love your help. Let us know what’s wrong with this preview of Raven Song by I.A. Ashcroft.
" *I received a free copy in exchange for my honest, unbiased review* Thank you!